Most people that have attempted (and some who have decided to no longer dabble) in the exciting world of paid search or display ads to drive business will be quick to tell you how “it didn’t work”. The follow-up question to that should be “What exactly didn’t work?”. There are a number of nuances that can go wrong when it comes to bidding on search terms or buying display space; but for those that know the rules, it can be very successful to be seen by those looking for what your business has to offer. 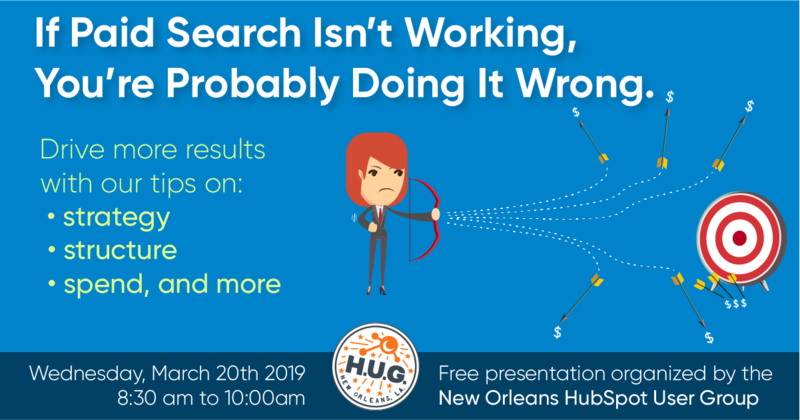 Join us to learn about build-out, budget and best practices (with a side of light breakfast) as Adele Tiblier, Chief Marketing Officer of Story Block, presents tips and action items to help you make the most of your paid search efforts. Whether you’re just getting started or already putting money toward it, invest a little time to get a real return on your ad spend. Marketers, Business Owners, or anyone who is put in charge of business growth.